I still haven’t figured out if it’s cheaper to replace or repair my broken camera. I really don’t need another expense right now, so I’m taking my time. Meanwhile, another kodak moment lurks around every corner. Last week, I pulled into my driveway and noticed one of the cats, Pinecone, chilling next to a gopher on the lawn. They were relaxed, alert. Just hanging. 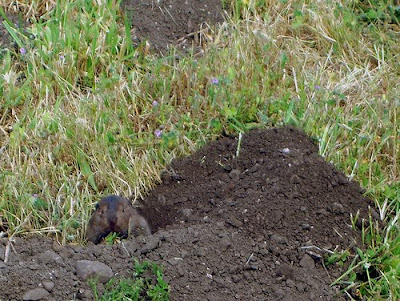 I assumed the gopher must be missing the back of its head. Pinecone is a good hunter. I walked up to take a closer look, but gopher buddy was perfectly intact. I literally said . . . what are you guys doing? They both looked at me and no one ran. I don’t think I’ve ever gotten that close to a gopher before. A couple days later, I see the cat and gopher hanging out in the same spot again. What the hell? That doesn’t make any sense. All I usually see of gophers is an internal organ or a foot left on the doormat. I felt like I should call somebody . . . aren’t there animal experts somewhere who would be interested in the first ever friendship between a gopher and a cat? But it ended badly. Daisy found a headless gopher in the front yard yesterday. Chances are it was our little buddy. Daisy and her dad buried it and planted something on top of it. They circled the little plant grave in rocks. Daisy was hopeful that the gopher would know where it was if it woke up. I guess this isn’t a very good story. I’m not sure what the moral is. Don’t trust your enemies even if they’re nice? It can take awhile to kill a gopher? Get that camera fixed so people don’t think I’m hallucinating Disney movies?